“All the person must be responsible in their own sphere. Everybody must be committed to perform their activities with philanthropic and patriotic mentality. Without developing moral obligation no awareness program will be fruitful. School and College teacher can work as mentor to drive the student in a right track. I am suggesting YPSA please don’t leave the student after the short period, try to keep them in a continuous skill development process. Then they will be good citizen in future for the country” said Professor Mohammad Shahidullah, Chief Education Officer of Chittagong City Corporation in his speech as Chief Guest. YPSA with the support of UNDP formally launched the project of “Creating evidence at the grassroots for national level advocacy on leadership development” on 25th June, 2015. The Chief Education Officer of Chittagong City Corporation Prof. Md Shahidullah attended as chief guest in the program. Mr. Md Kamrul Hasan and Nondon Chandra Paul from of UNDP; Mr. Palash Chowdhury, Director Finance along with other project staff of YPSA and Representative of principal/head master, School Management Committee and governing committee members, teachers, students, and guardian of the selected institutions were present in the launching program. 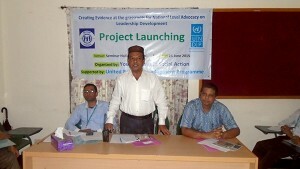 “I would like to thanks YPSA and UNDP for initiating this project, which will be very fruitful for the Madarasa student to learn the techniques to identify the social problem and find the solution, which is the moral responsibility of a citizen too” said Mr. Muhibbulah Azad, Vice Principal, Sitakund Kamil Madrasa, Chittagong. “It is true that most of our students have apathy to social engagement process. Meritorious students engage their most of the time with text books and guardian also encourage them to concentrate on it. Their idle time spends with browsing face book and internet instead of social activities. For this reason their social responsibility and leadership quality are not developing. As a result our nation deprived from quality leadership. We expect that the pilot project pave the way of developing quality leadership including engagement with community activities, which will be expanded in the elsewhere of country with larger space.” said Mr. Mohammad Kamrul Hasan, Programme Officer, UNDP. Fowziyah Abida, Mr. Ariful Islam, Student; Ms. Umme Salma, Student; Mr. Shahedul Kabir Chowdhury, Lecturer, Department of Biology, Soraipara City Corporation Degree College, Ctg; Mr. Habibur Rahman, School Management Committee Member, Kattali City Corporation Girls High School and College; Sha Sultan Shamim, Guardian, Sitakund Degree College; Mr. Liton Kanti Dev, Teacher; Mr. Md. Hadayet Ullah, Teacher also spoke among others in this launching program. 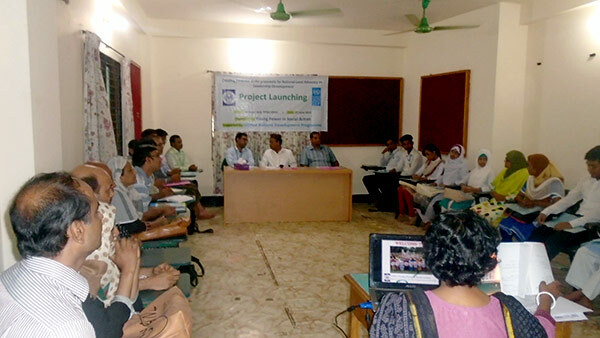 Finally all stakeholders from the selected institutions of the program expressed their strong commitment to support this activity which will smooth the journey to onboard the orientation and social action project in Chittagong City Corporation and Sitakund area.